Miss Jekyll recommended digging a hole of a cubic yard and filling it with manure and compost for Cardiocrinums. It is sometimes quoted that a dead sheep or cow(!) should be included but that is the formula for vines. Miss Jekyll only recommended a rabbit. However, we've been told that Major George Sherriff recommended a dead Yak! It is sufficient to dig a hole which will accommodate the bulb in its flowering year, This will be about the size of an Association football for C. giganteum, so we mix a cubic foot of compost or leaf-mold, soil and slow-release fertilizer, (we use Blood, Fish and Bone meal in place of the rabbit! 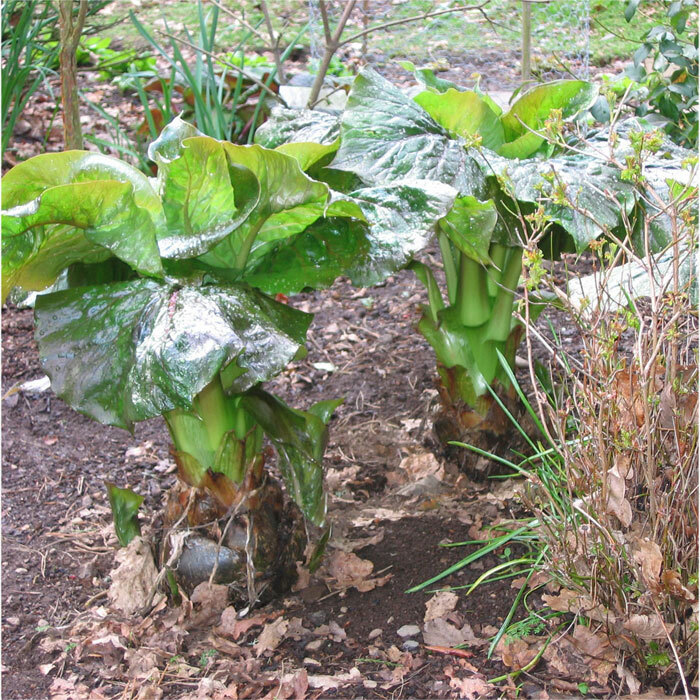 ), although a larger volume will produce a taller plant. I would also council against the "firm rightward twist" which is liable to damage the rather brittle roots of the bulbs. We don't give the C. giganteums any more feeding once they're planted but the C. cordatums and C. cathayanum are given a liquid feed each Spring. These are plants of woodland shade and experiments with growing them in an open, sunny location have resulted in smaller plants with fewer offsets probably due to a lack of moisture in the soil and increased transpiration. However, they do grow and flower and their reduced size might be a benefit in a smaller garden. In their growing years, Cardiocrinum produce a rosette of large, heart-shaped leaves. When they are going to flower, the growth is vertical from the earliest days of spring. Some authorities recommend covering the nose of the bulb with bracken for winter protection. We haven't done this and there've been few losses, (see below). 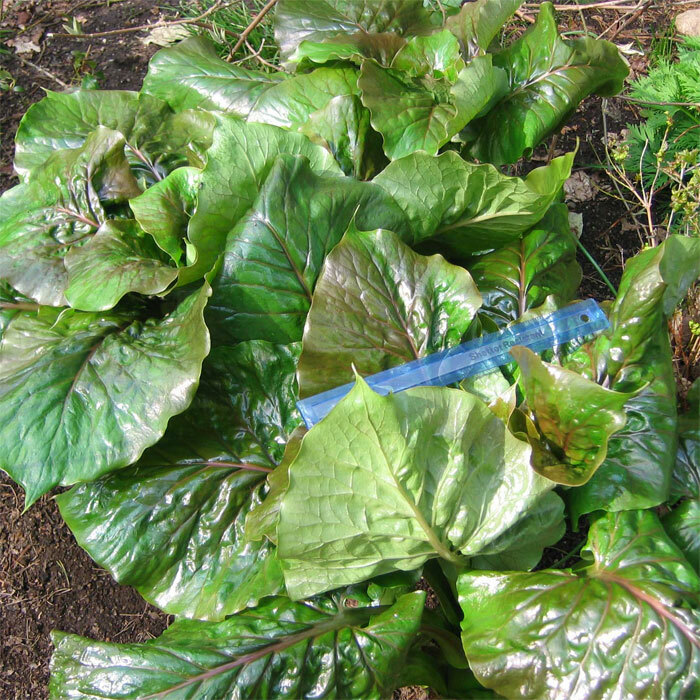 There would also be the risk of straw or bracken getting wet and compressed which might cause the bulb to rot. This past winter gave us over three weeks with temperatures around -5°C. The plants had no extra protection but there were no signs of any losses. The past winter gave us two weeks with temperatures around -15°C. The plants were given no extra protection and there were some losses of very small bulbs planted the prevous spring. We've had several winters with sub -10°C temperatures and a number of smaller bulbs have died. This has been particularly true of C. cordatum offsets and I'm now growing these on for a year or so before planting them out. In general, C. cordatum seems to less vigorous than the other forms. There are less offsets/plant and the seedlings take longer to mature: none of the first batch of seedlings have developed a second true leaf after three years.